The interior design was developed by the world famous company Italdesign Giugiaro, which also designed the Italian train Pendolino and participated in the creation of the Volkswagen Golf. One of the most important features of the new train is a fundamentally new depreciation system, which excludes shaking at high speed. The double-decker seating train replaced an old ordinary seating train while offering lower prices and more modern and comfortable stuffing. On the upper deck of the 5th carriage there is a children corner with soft sofas, TV, toys, a table and chairs where children can draw. Eight seats next to the children corner are sold only to the passengers with children under 5 years old. Carriage: better arrangement of seats, a/c, bio toilets. Included service: meal, travel kit. The cabin is sold entirely. Included service: meal, hygienic kit, newspapers, rug. Carriage: superior; a/c, bio toilets. 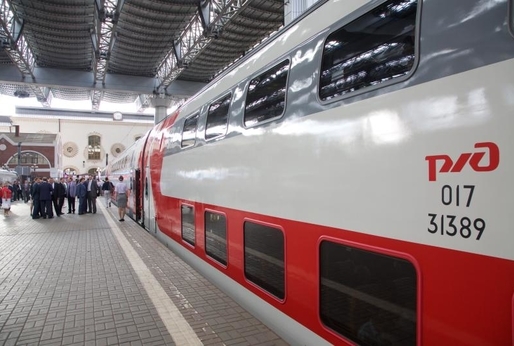 The first Russian seating double-decker train operates between Moscow and Voronezh since summer 2015. It became a really great alternative to sleeping trains on this route, with convenient schedule, affordable price and high level of comfort. The train includes 7-14 seating cars of the first and second class. The first-class carriages have 58 seats arranged 2+1 and a compartment with 2 seats. The second-class carriages include 102 seats arranged 2+2. All the first-class seats can be rotated 180 degrees, which makes it possible, if desired, to sit face to the window or to fellow passengers from either side of the passenger. In the cars of the first class there is also an optional diffused illumination on the ceiling. For those who is looking for privacy there is a separate two-seated coupe with a large TV. Armchairs in both the first and second class cars are very comfortable. It is possible to adjust not only the inclination of the backrest, but also the position of the cushion at the seat. Each seat has a socket and individual lighting. 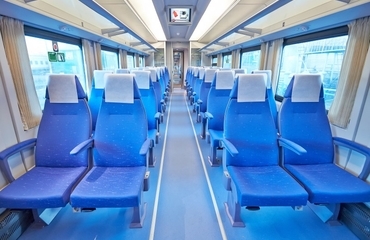 In the first class cars, hot meals are included in the price, and in cars of the second class there are vending machines with snacks and soft drinks.